The 20th-century demographic struggle for power translates itself into an inter-ethnic war of numbers. 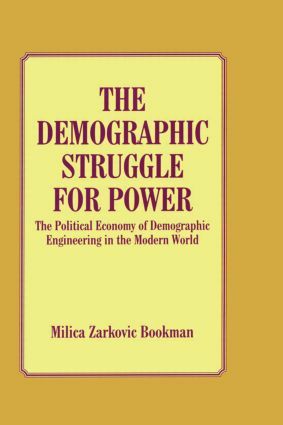 This book offers suggestions for structural alterations within states to sever the link between ethnic size and power, and thus eliminate the rationale for the demographic struggle for power. American Renaissance - "One of the most straight forward and factual accounts now available of how ethnic animosity creates conflict and violence"
NATIONALISM AND ETHNIC POLITICS - "This book takes on a herculean and important task: to analyses demographic engineering." IMR - "This book is impressive in the amount of information based on the author"s incredibly wide range of knowledge and research." Ethnic Conflict - "…this is an excellent book. It is strongly recommended ." The Social Contract- " this book is a highly valuable account of poputlation, cultural, and ethnic policies in reecent history and throughout the world"
Iniative on Conflict Resolution & Ethnicity- " this is an excellent book. It is strongly recommended"
"Packed with facts and intricate arguments about matters of great import. … Essential reading.